The West may have finished Week 6 over .500 at 15-10, but the East put a dent in the record-breaking point differential after laying some smackings on them. Those were mostly thanks to the Toronto Raptors and Washington Wizards as they went a combined 4-0, each win by eight or more points. It wasn’t too pretty for the rest of the East teams in non-conference play. Chicago, Detroit, Indiana, and Milwaukee all went winless, a combined 0-9. At least Philadelphia scored their first win of the season…on the road…against a West team. (Dammit, Minnesota). The undefeated West teams last week with multiple non-conference games were Dallas, Golden State, Oklahoma City, and Portland. Utah and Denver went winless. COOL. Below is the updated non-conference stats through Week 6, and below is a screenshot of the scores from all the games. Thought I’d include them in case anybody was curious. 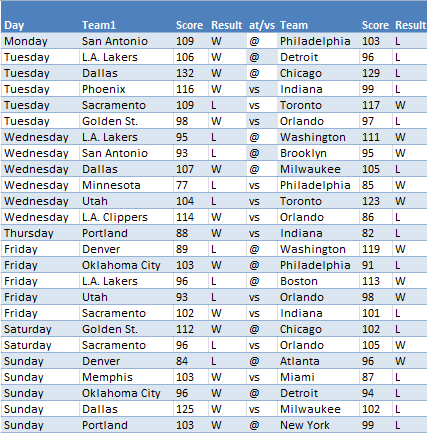 Statistically, Week 6 may have been the East’s best showing so far. I mean, there’s even a loss by San Antonio. GOOD GRIEF. It’s between Week 2 and 6 for the best, which is pretty pathetic since the East finished neither of them over .500. 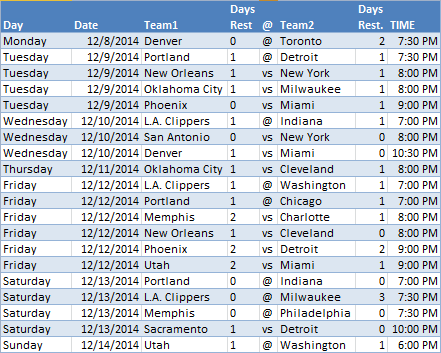 Week 7 is a slightly shorter non-conference schedule with 20 games versus the 25 we saw the last two weeks. There’s also finally a home-road edge for the West, though a small one. Cleveland, Detroit, Miami, and New York take road trips out west while the Clippers and Blazers will or are already playing multiple games on East courts. The other teams with multiple games this week are Indiana, Milwaukee, Washington, Denver, Memphis, New Orleans, Oklahoma City, Phoenix, and Utah. For the West, only San Antonio and Sacramento are on the non-conference schedule but with only one game. FUN STUFF. Kevin Durant is back, so we’ll see him in what looks like a great matchup vs Cleveland on Thursday night. There are some other goodies like Portland-Chicago, Clippers-Washington, and a good ol’ repeat of the 1999 NBA Finals in San Antonio versus New York. The Spurs still have the same roster, pretty much. Kind of crazy that Tim Duncan, Tony Parker, and Manu Ginobili all came together only a few years after that first title. ANYWAY. If you somehow made it to the end of this post, I’d recommend checking out Zach Lowe’s column about non-conference disparity and Ziller’s fantastic piece about a solution for it. I’ll roll out at least a couple of more posts this week, including an addition to the My Soup section. Unfortunately it’s not really soup but weird stats I’ve put together. They don’t taste like anything and if they smell bad it’s probably you. Sorry. Have a good week, though.